Hanoi (VNA) - Nguyen Quang Hai scored his first goal for the national team in Vietnam’s 2-1 win over Cambodia in their third Group C match of the Asian Football Confederation (AFC) Cup qualification in Phnom Penh on September 5. The victory ended Vietnam’s winless streak that saw the team finishing with draw and loss results in five matches in a row. Vietnam said goodbye to their head coach Nguyen Huu Thang after their unexpected defeat at the 29th SEA Games last month. The team was being managed by acting coach Mai Duc Chung. It took the visiting side just four minutes to find the opener at the Olympic Stadium, which lured nearly 50,000 spectators, most of whom were home supporters. Midfielder Nguyen Van Quyet netted a close low shot into the far corner of goalkeeper Sou Yaty, who dived to his right but failed to block the ball. However, the early goal did not help Vietnam have a comfortable game against the hosts who created a lot of difficulties for their rivals in the remaining time. Cambodia needed only six minutes to level the score, which was achieved by their very own ’Messi’ Chan Vathanaka. Two Cambodians worked together in the box, which was watched by six Vietnamese players and goalie Dang Van Lam. Vathanaka sent his teammate’s pass to Lam’s right corner and made his 12th goal for the national team. After their goal, the Cambodians attacked strongly. They gave no chance to Vietnam. Well-known Vietnamese striker Nguyen Cong Phuong was unable to reach his peak and was replaced in the second half. Chung, who will return to work with the national women’s football team after this match, made several changes in the second half, including an unexpected replacement of Vu Minh Tuan. Tuan suffered a twisted ankle and had to leave the field, giving up his post to 19-year-old Hai, who made it 2-1 with an accurate header that could not be stopped, although he was only 1.68m, one of the shortest players for Vietnam. "It was a difficult match for Vietnam, as we have never played on artificial grass before and had few days to become familiar with it. Tonight, we were against many Cambodian supporters," said Chung at the post-match news briefing. "Cambodias are different now. They are much stronger than before. They created many challenges for us, but we found their weaknesses. Their left-wing defender often took part in the attacks, but they returned home slowly. Our first goal was made by exploiting this opportunity. Their mid-field was not strong enough, only two against Vietnam’s five, so they could not resist our attacks," he said. "Vietnam were also not good today, but look at the overall result, we netted a win; it is what we need," he added. 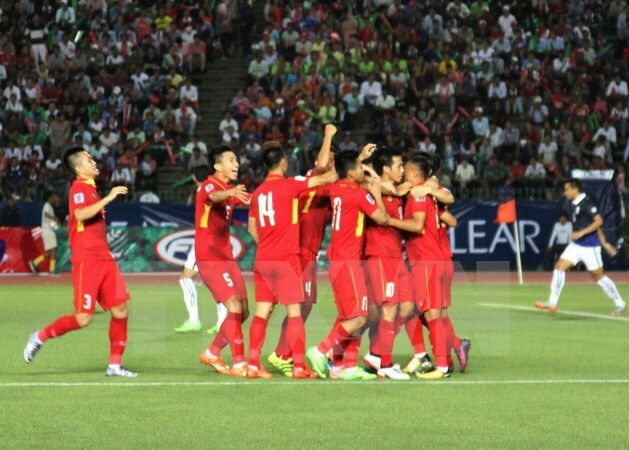 With the win, Vietnam improved their winning record over Cambodia to six matches. Vietnam have never lost to Cambodia to date. They jumped to the top position in the group with five points after three matches. Jordan are second with four points but have played only two games. They will play Afghanistan in the next match. Cambodia are third with three points.